The Gay Gamer: Will Escape from Bug Island be worth our time (and money)? Will Escape from Bug Island be worth our time (and money)? The publisher bringing the much maligned game to the U.S. seems to think so. 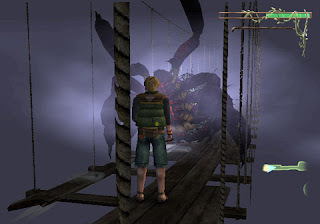 According to a recent interview posted to IGN.com, the folks at Eidos Interactive have tweaked some of the graphics and tightened up the gameplay, making the Escape from Bug Island a better experience than the Japanese original, Necro-Nesia. Whether or not that means it's an overall worthwhile experience has yet to be determined, though the hands-on account from IGN's writers provides at least a glimmer of hope. I've had my eye on this one since it was first announced, mainly because I love the idea of running around and slaughtering disgustingly huge insects (and shining a flashlight on them using my trusty Wiimote! ), but I'll await some actual reviews of the U.S. build before handing over my hard-earned dollars, thank you very much.